The Holiday catty goes live Sept 1. I am so excited for the upcoming season. The weather will be cooling and the leaves will be changing. I am currently working on some of the kits inside the holiday catalog. The witches hat is really cute. I started the wreath, alot of pieces to this project. I will show you soon. 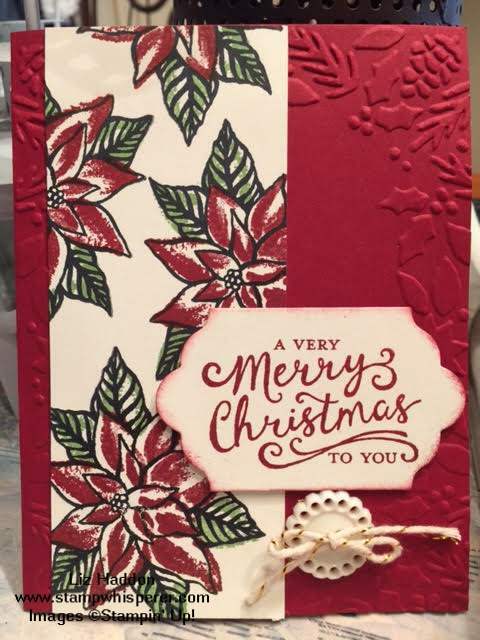 Today I am sharing my poinsettia card. Anytime Stampin' Up! puts a poinsettia stamp set out I have to get it. I remember my dad every year bringing home a poinsettia plant for my mom and it always made her smile. Anytime my mom smiled it warmed my heart. So here you go. I hope it brings a smile to you. I used the stamp set "Reason for the Season" item# 139730. You can order this beginning Sept 1st.